Some people turning on iCloud Music Library to make full use of Apple Music are instead coping with deleted songs and playlists, in addition to other problems, according to complaints on Apple's support forums and testing by AppleInsider. 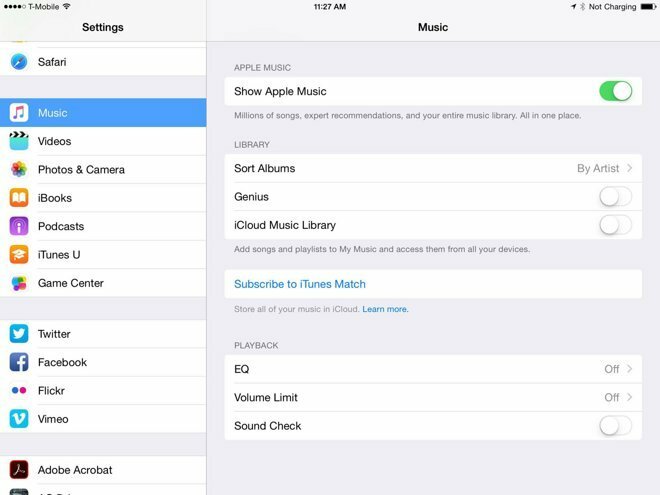 iCloud Music Library, an option in both iOS 8.4 and iTunes 12.2, is needed for advanced Apple Music features such as offline caching and remote streaming of an uploaded iTunes library. For at least some users, however, turning the option on may not only delete local playlists but cause the songs that were in them to vanish. Syncing changes can potentially wipe out files and playlists across devices. Less serious issues can include iCloud substituting bad metadata and artwork, creating duplicates, or restoring music that was previously deleted from iTunes Match. Indeed, the problems are similar to those that have been affecting Match users in recent days, and to a lesser extent since Match launched in November 2011. Another reported problem with iCloud Music Library, noticed by blogger Kirk McElhearn, is that if it matches an uploaded file with one on Apple's servers, trying to download the file again will yield a copy-protected version rather than the one that was originally uploaded. iTunes Match normally restores originals. One current solution to renamed or missing files appears involve retrieving an earlier ITL (iTunes library) file, dragging it into the iTunes folder, and then renaming the newer, corrupt file to something different followed by changing the restored one to "iTunes Library.itl". Opening iTunes again should show a fixed collection, although users should not attempt to turn on iCloud Music Library a second time.